Ceramic tile repairs can easily be carried out on site in place whether a tiles are chipped, dented, cracked, or scratched. Repair and Restore team of technicians are able to repair a tile regardless of the damage and condition of the tile. To check out other flooring and tile repairs we carry out, click the high lighted text link. 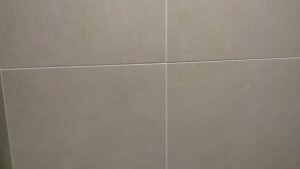 Using methods, and materials tested greatly over many years Repair and Restore can offer amazing results to any ceramic tile repair making the damage invisible using special hardened coatings, chemicals and fillers only available to the trade. Our highly trained specialists are able to mix tints together with in the base coating matching any colour tile and then coated with a clear coating matching any finish, whether Matt, Satin, Gloss and anything in between. Using an extremely hard gap filler that adheres to all building materials, Repair and Restore ceramic tile repair specialists back fill any large holes ensuring area is structurally sound and ready to have a layer of fine finish filler applied to the gap filler. The Fine finish filler is applied is extremely hard and gives the repair a smooth finish after the area is profiled and ready for coating with a special 2 pack primer. Once the area is prepped and primed the next step is to coat the primer with the base coat to give it colour and texture, after this a tough clear layer's applied to the ceramic tile repair, which is extremely tough and hard-wearing. The above pictures are of a ceramic tile repair made on a site, the contractor had mistakenly fitted the wrong type of shower head bracket, there was over 100 screw holes to be repaired as some mistakes were made when the installer was fitting the shower head bracket. The builder had change the position of the brackets several times to make the fixture look good to the eye, drilling more holes and creating more work, but it was not obvious the extra holes were there until the brackets were removed, we made a ceramic tile repair to the remaining holes saving the contractor a great deal of time and money. The area the tiles were adhered to a was box section constructed from timber and plywood, the concern was in removing the tiles and tile adhesive the the plywood sheet would have been damaged creating more work as the entire box section would have had to been removed, also when removing individual tiles there is always a chance of disturbing the surrounding tiles and possibly damaging them or making them loose. 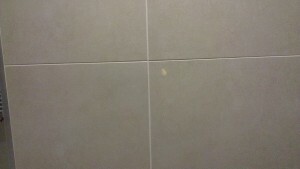 The other concerns with removing individual tiles is the new grout applied very rarely matches the existing grout due to the build up of dirt and wearing that is unnoticed over time, and it is often very awkward/near on impossible, to seat a tile in flush and square when the surrounding tiles create a restriction.